Planning to travel or take advantage of the great discounts offered in summer? United Bank for Africa (UBA) Plc has advised that customers should not border with cash but just go pick up any of its payment cards as it is safer and more secure for making both online and offline payments whether in Nigeria, or in over 200 countries around the world. 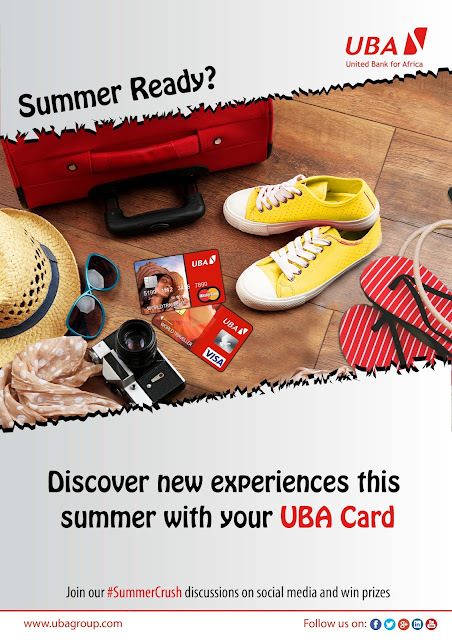 Be it a vacation with the family or an item to purchase, there is a UBA Card story behind every memorable summer spend. Customers and intending customers can walk into any of UBA’s business and be issued a payment card in 5 minutes. It is another first from UBA to ensure customers do not wait endlessly to receive their cards and also address the needs of customers that may have lost their cards, or have expired cards and also new customers that may want to pick up a card to make online payments and take advantage of the season of sales around the world. There are several reasons why UBA issued payment cards are preferred for making payments. UBA cards are accepted on PayPal. This means UBA customers can play in the global e-Commerce payment space riding on the PayPal platform. UBA customers can register their preferred UBA Card on PayPal and shop in or from any part of the world right from the comfort of their homes or wherever they are. UBA Cardholders can hold on to fond memories with the UBA “All About U Card” which allows customers brand their Debit Card with a favourite picture. This transforms the card from just a payment card to a desired personal card that allows customers take treasured memories with them where ever they go. A UBA Prepaid Card is just the ideal travel or shopping companion this summer. UBA pioneered the use of the Prepaid Card which does not require a bank account. A Prepaid card is also ideal for online shopping as only amounts loaded on it is at risk and helps users to easily control their expenses. There is also the UBA U-Advance card, which offers customers emergency cash. It addresses the need of customers for quick cash. It is however available only to salary account holders with UBA Plc, but non-UBA customers can pre-qualify by opening a salary account with UBA. UBA’s strategic partnerships with local and international Merchants continue to earn its Cardholders discounts on purchases across the world. Offers range from shopping to travel, dinning and general merchandise. The Bank has introduced hundreds of offers to its cardholders since the launch of the UBA cardholders loyalty scheme. UBA cards are accepted in over 200 countries and on millions of POS terminals and ATMs around the world. This implies that UBA cardholders are never stranded in any part of the world where they decide to shop or do business. UBA card holders can make cash withdrawals in over 1.9 million ATMs worldwide and POS or web purchases at more than 30 million retail outlets around the world. 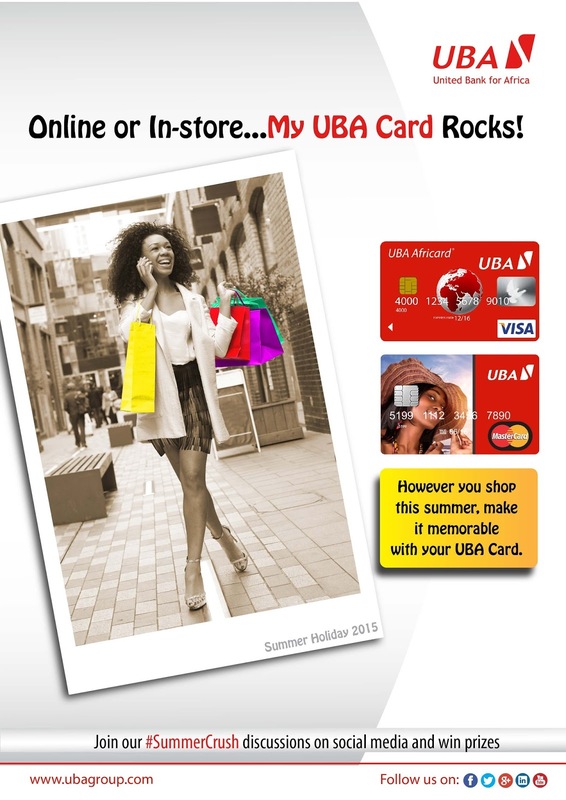 UBA Cards are trusted, reliable and protected with advanced technology for online payments. In addition, UBA MasterCard and VISA cards are fortified with MasterCard SecureCode and Verified by VISA features respectively for secure online transactions. For safety, the UBA cards come with the EMV certified chip and PIN technology plus the 3D secure feature for enhanced protection during web transactions. The bank has invested heavily in building a robust and secure e-Banking platform that supports its operations through strategic partnerships with various local and international organizations. A highly diversified financial services institution, UBA is leading provider of innovative e-banking solutions across Africa and one of the largest financial institutions in Africa, with offices in New York, London and Paris. The UBA Group has strong retail penetration across 18 African countries with millions of customers that enjoy a bouquet of products and services tailored to meet their different financial needs backed by cutting edge technology that offers secured and convenient real-time online banking services. With a customer base in excess of 8 million, UBA has evolved an e-banking approach, which is aimed at improving service delivery and delivering positive customer experience.